A delicious treat for a campfire dessert. The kids (and adults too) will love them! Build a campfire, then let it burn down to coals. While the fire is burning cut yourself a stick from an alder or bush about 4 feet long with a diameter of about an inch to an inch and a half. Peel the bark about 2 inched at the end. Before the coals are ready melt some butter. 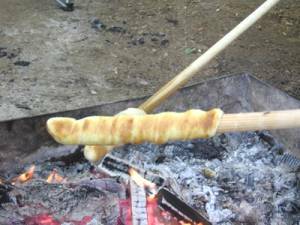 Once the coals are ready, take a biscuit, pull it over the end of the stick that you removed the bark from, pull it down the stick about 1 inch (it should look like a large Q-Tip (cotton swab). Put the biscuit end over the coals and rotate until the biscuit is golden brown. Take the biscuit off the stick and roll in melted butter, then roll in confectioners' sugar (or roll in cinnamon-sugar, and then sprinkle confectioners' sugar over it). Fill with pie filling and top with whipped cream. Servings: As many as you like.